Pulling up to stand is one of the most notable milestones your baby will reach. Standing shows that your baby has the stability and strength in his legs and core to support his body. Your baby will try and stand up against everything he can even if it is only for 2 seconds. 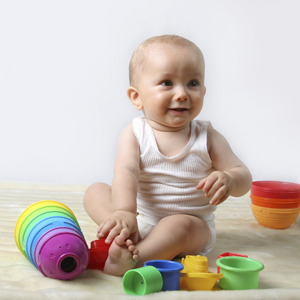 Your baby will start to stand up against furniture from around 7 to 10 months. Make sure that your baby is not left alone when he ventures out to explore. down from a coffee table. Remove small items he can choke on from places he can reach. can drown in as little as a few millimeters of water. Also keep the toilet seat down. Remember to make your baby's cot safe to stand up in before he can stand as he might catch you by surprise. Place your baby's favourite toys on a low table in front of her. It should be a very stable table. Encourage her to play with the toys while in a standing position. Should I use a walking ring? Use on a flat surface free from electrical cords or loose rugs and keep the baby away from.